Bullet train in China: Where is the U.S. competitive advantage? I just came back from a long trip in China and Taiwan. During the trip, what impressed me the most was China’s bullet train. We rode the longest high-speed rail line in the world – Beijing to Guangzhou – which started services only a few months ago. The train is futuristic, comfortable and extremely smooth. Zipping at speed of 300 km/h or about 190 mph, the water in my glass sitting on the table stayed still. With such a speed, one could travel from New York City to Washington DC in one hour and 15 minutes, or from New York City to Chicago in three and a half hours. High-speed rail truly shrinks the country. China was able to start from zero and build 6,000 miles of high-speed rail in seven years. The goal is even more ambitious – to have 30,000 miles of track by 2020, a mere seven years from now. As I was riding in the train, I said to myself – this could never happen in America. Recently, Montgomery County, where I live, just finished an expressway of 18 miles called the cross-county connector. It took the county 50 years from planning to finish. Because we are a democracy, every opposing view needs to be listened to and addressed. Bold, broad and forward-looking infrastructure projects like high-speed rail are very hard to undertake and complete in America. This leads me to ponder – we can not compete with China on speed of decision and boldness of projects, where is our competitive edge going forward? I’d love to hear your thought on that question. 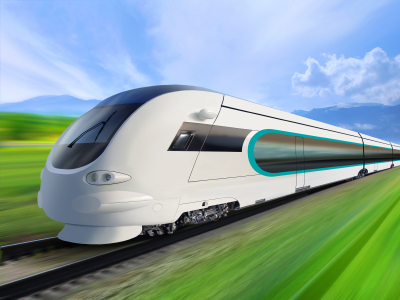 10 Responses to "Bullet train in China: Where is the U.S. competitive advantage?" IMHO Politically we have made the decision to not do this sort of thing. I remember reading “Future Shock” in the 70s. It foretold of many changes including moving away from manufacturing toward service industries. Everyone would be well educated and we would no longer have people “laboring” in industrial America. This begs the question, “who would build high speed rail?” Neither the accountant, the attorney, the doctor, nor the barber would have the skills. At the same time, as a Nation, we have also given a louder voice to those supporting the environent. The rail system probably would save on green house gases, but what about the habitat of all creatures great and small where the rail system would be built? These two forces, and probably others, have caused us to reduce our production of “things”. We like technology and we especially like to buy it cheaply from foreign makers. At the same time, our chief industry has become more and more paper shuffling. The people that help us arrange our tax documents for filing provide a wonderful service. They do something few of us could do for ourselves. On April 16th, what is the intrinsic value of last year’s tax filing? Or, last week’s trip to the barber? IMHO there is no wealth created by much of the service industry. This grand scale move to service sector while importing much of our manufactured goods has made the USA a debtor nation. Instead of using our resources and labor to build things the world wants to buy, we make our living brokering deals, filling out papers, and cutting hair; then spend the cash on Iphones, big screen TVs, gasoline, groceries from all around the world. This gives China a huge advantage. They have the labor force and the wealth created by their awakening manufacturing industries as well as the ability to make a timely decision and see it completed without red tape. Gee, that’s kind of the way the USA was during the industrial revolution. Back to the question, “Where is our competative edge?” We have none. We decided to give it away, out of “fairness” I suppose. Now we look around and want to be like France or China or anyone that seems to be moving ahead. Instead of being the next big thing we are looking for it. If, we deicided politically, to make our tax environment the most attractive in the world and our regulatory environment the easiest in the world then the next big thing would find us. We wouldn’t have to look for it. Investment Capital and ideas would flock at the gates to start up here. The present iteration of American Government has crippled the concept of capitalism. Capital flows to the best ROI, and right now USA is not where it’s going. Those ideas are esay to write down. When groups of people would fight to death for the life of a minnow or snail, it’s not so easy to change. That’s representative democracy. In China, the boss says build it, and things start to happen. The US can build advanced bullet trains, but does not have the political will to do so. Modern tracks can replace many existing rail lines without the need to re-plan or re-zone or buy land (except for the most heavily built areas, e.g. the East Coast), most of which were the reasons for the cross-county connector highway’s delay. The two types of construction are not remotely comparable, Michael, nor are the two types of government. China’s dictatorship does not have to bother with pesky details like the rule of law or the opinion of voters outside of the Communist Party. You usually think much better than this. I am disappointed. GLibertarian nonsense like the first comment will not help the US become competitive again. The US did not lose manufacturing out of a sense of “fairness” (what are you smoking, Ron?). Company owners and managers outsourced manufacturing to countries with the cheapest labor, ineffective labor laws, no safety rules, and no environmental regulations in order to maximize their profits, bonuses, and stock options at the cost of the US middle class. Over the last 30 years, they also slashed domestic worker’s benefits, flattened wages (lower after inflation), and gutted regulatory enforcement. Without those higher-paid jobs, a large chunk of the purchasing power of the US was cut. Now who will buy the products? Our public education system has been gutted by small minds who value “low taxes” more than a smarter next generation. Our taxes are the lowest they have been in about 65 years -see the Congressional Research Service report from September 2012. The regulatory environment Ron complains about maintains the other environment, the one that sustains life. China has mountains of toxic waste, cities with barely breathable air, and a political dictatorship that also happens to own most of the capitalist side of the economy. I do not envy them. We could do a lot better, but the delusional thinking will not help the US recover our competitive advantage. I am actually fully aware of the all of problems in China, which you mentioned a few. I might add tight control of information to that list. Given a choice, I would not want to live there. That said, for the point of debate, don’t you agree the interstate highway system built in the 50s and 60s had changed American and catapulted the country into economic preeminence? Time has changed, we can no longer do that kind of bold projects, China still can. Other factors might still weight it down, but i am afraid the national grid of high speed rail might do to China what interstate highway system has done for America. Yes, Michael, I agree with your points. China is also making great strides in modernizing their energy production, leaping past old technology into more advanced sources such as solar and wind power. I am as much positively impressed by China’s advances as I am repelled by their problems. Then again, I can say the same about my own nation. However, I think some of my points were valid- Montgomery County cannot just evict owners in a month and bulldoze as can China, slowing construction. China has a construction advantage by being autocratic. For the record, I did not think you were _unaware_ of the problems I noted in the comments I made about China, though I think you overlooked them in your argument. Besides, some of my compatriots have never traveled beyond their own towns or states, never mind outside of the US, and may be unaware. I agree that high speed rail will be a great benefit to China’s advancement. The US needs investment in solar, wind and nuclear energy, high speed rail, electric vehicles, space exploration and other technology. I am saddened that people here do not see beyond their own small points of view and are holding the US back. Those who whine about our “high” taxes or climate change while loudly proclaiming “we are number wuunn” are the ones guaranteeing that we will become an also-ran. I do agree. The point I was making is that politically we have taken ourselves out of the “big Project” game. We decided it was better to send $700B a year to the oil producers rather thn produce our own. We decided to spend $700B a year on wars where we will give the spoils to the other guys. War has never been that way historically. We decide to discourage our own industries through regulation and restrictive policies. If the decision makers would lower the corp. tax rate to the lowest in the competative nations. If they would lower the capital gain rate to the lowest. If they would make EPA similar to the county building inpector; someone that tells you how to do a thing instead telling us “you can’t do it.” If changes were made in that manner then capital would pour into USA, because capital follows ROI. Capital can fix many funding problems that Taxing cannot. On the course we are on one day there will not be enough taxpayers to raise the needed revenue. The golden goose will be dead. In John Rutledge’s book, “I learned to invest riding a horse”; he described Singapore with millions of people enjoying G4 cellular service. This was at a time when we just got G2. Why, because investment capitol is attracted to Singapore. Taxes are favorable, profit is not a dirty word. When was the last time a Venture Capitalist was the lead story in America? The reason is they are not needed here, the action is somewhere else. We live in a competative world. All I’m saying is that if politically we have decided to outsource everything, those who wish to prosper will follow the money. We can have a blend of productivity and ecology, but IMHO we cannot have both a competative fully employed workforce and a panacea of Sierra Club fantasies. We can’t judge by the unemployment numbers because they don’t include discouraged and underemployed people. Today, depending on the day, we have a total participation rate of about 65%. Much of our GDP is spent offshore on products and resources we no long wish to develop stateside. If we continue to ignore the people who did not go to or do well in college eventually our economy will crash as we try to provide safety nets for all who are not skilled enough to protect full time work. The college grads with degrees they can’t find work for; the ones moving back in with parents, where will they go when mom and dad retire or pass away. Jerry, all you say about the the business owners and corporate execs outsourcing is true. But, you overlook the underlying question…”Why”. The answer is my same answer, capital follows ROI. The laws, regulations, and taxes here have created the outsource opportunity. Much of quality manufacturing is done robotically today. Labor represents a much lower percentage of cost than in the 60s. Still, the total tax environment makes the decision to outsource compelling. I believe US robots can run just as efficiently as Chinese, Mexican, or Canadian robots. But how does the money flow in each of those Countries. Apparently more favorably. GM, the save child of American industry, is in all three countries. They may not last another 5 years because in their bancrupcy they neglected to address the legacy costs of their retirees. If they can’t outlive those costs the next reorganization will be much different. There is also an economic impact in favor of our nation if we produce more here and spend that cash here on other items produced here. The burden for govt support goes down while tax revenue goes up (more tax payers rather than extreme rates). That only happens with growth in all sectors. Service sector and govt sector alone are a 3 legged stool with one leg missing. That’s not an isolationist view of the world. It’s a use what you have to the best benefit concept. You can call it Glibertarian if you wish. Progressives are very good at polluting language. The truth is in my life I have started and turned two small businesses into successes by fostering growth. Sales, or the top number, fixes every mistake in the calculations. The opposite of growth, decline, leads to more and more desperation and problems with poor solutions. As a nation, we need to figure that out. Michael, would you please explain that statement? The first part is meaningless, taking an assumption and calling it a fact. The second part just plain makes no sense to me. Ron, you start strong but miss the forest for the trees. It is precisely the GOP’s deregulatory business-first mindset that is causing so many basic problems in the US, for example income inequality leading to lack of spending power leading to a depressed economy. Even Adam Smith said that businesses need regulation for them to be kept from becoming monopolies and doing harm without consequences. As far as my comment on your “unleash business from the big bad government” Libertarian stance, that really means we are in a race to the bottom. We cannot out-compete other nations by starving our own workers and stripping even more wages and benefits. Please show me a thriving economy with a massive number of impoverished workers. Please show me where in the real world widespread deregulation works and has not made the local environment a hell-hole. There is no functioning country on the planet now or in history which is based upon those type of libertarian principles. There are many well-functioning social democracies, with good economies and mandatory good benefits and reasonable regulation and a strong social safety net (see Germany among many others). It can work here, because there are so many examples of how it works elsewhere, but too many people believe the GOP’s corporate-fed lies and scare tactics. Too many people in our country keep saying that America is “exceptional” as an excuse to avoid looking at reality. We don’t need to unleash businesses, we need to increase the minimum wage to stop businesses from hiring people at starvation wages. Walmart is not a success story- it thrives on taking advantage of government handouts- both tax credits (directly) and food stamps (indirectly). Walmart and some of its’ competitors have written in their hiring packets instructions on how their newly-hired exactly-part-time minimum wage employees can apply for welfare and food aid. That drains the local governments, with the net profits going right up to the Walton family (one of the richest 400 in the US). Then they spend some of those profits on propaganda against unions. Aside from those few, who does that lax policy help? You? Me and my tiny business? Hardly. I have no doubt that you built your own small or maybe even a larger business. What you do not see is that the largest corporations have paid lobbyists and front-groups and bought / bribed politicians to make our regulations favor the largest businesses over smaller ones. Have you ever heard of the Main Street Alliance, a small business owner’s group? The MSA actually opposes most of the deregulation mindset, because it allows big corporations to crush the small ones. We need smarter regulations, not deregulation. The reason why outsourcing is so lucrative is because corporations have paid politicians to create so many loopholes and tax law favors for them. A large corporation can afford to take advantage of those while a small business cannot. The top business tax rate is 35%, I believe, but none of the top corporations pay even close to that amount. Think about why. Do they really need protection from government, or do we need protection from them? Think about it. You don’t over look the non-working population, but it somehow is inferred they are the new normal. If we can’t find something productive for all of our people to do, then we are faced with providing for all our people by only the citizens that are useful. I’d be open to closing all of those loopholes and go to a flat tax or even the fair tax, which provides a debit card each month necessicities that should be untaxed. After the card runs out we all pay something. I’m told the trouble with the flat or fair tax is it’s unfair to the poor. I’ve noticed the people making this argument either prey on the poor or have never been poor themselves. I’ve been poor. It never occured to me that what I needed was food stamps and find a way to get assistance. What I needed was a job, with an economic ladder to climb. The Govt has “invested” a lot of money trying to create jobs. They can be and have been criticised for it. What I have found personally is when I have a project I want to get done quickly, or the task is outside the scope of my ability, I hire someone to do it. In January 2010 I had craftsmen calling me to be certain I was still rehabbing houses. I hadn’t set out to create work for those people. The need for a task to be done and the ability to create or find working capital made this happen. This is how jobs are created in the private sector. A businessperson wants to get something done. The $16T qustion for government, large or small, is how do they create the environment that fosters growth. It’s pretty obvious just throwing money at it doesn’t work. We had this same conversation 35 years ago in the barber shop. Fostering growth, creating more taxpayers, resulting in less safety net needs is the other end of the continuem from Capital Chronism or picking winners from inside the beltway and provdingssistance for those in need. It seems to me we have, as a nation, differing points of view about what govt should be and do. I fall in the “protect the borders and deliver the mail camp”. I deeply believe that when people solve their own problems we will have real solutions. The other side, in an unclearly defined bundle of good will, wants to be helpful to/for the down trodden, poor, sick, unemployed, underemployed…this list really has no end because as soon as one thing is fixed there is another group of people that need their help. That is noble and altruistic. Charities have done that sort of thing successfully for many years. The difference is when I give to a charity it’s because I want to. When I give to the govt it’s because I have to, and I have no choice in the “investments” they make. Some commentators call that theft. Most of us grew up listening to fairy tales. Robin Hood was a good one, they even made movies about it. What could possibly be wrong with taking from the rich and giving to the poor? First off, it’s a fairy tale. The rich guys would figure this out and avoid Sherwood Forest. Or use a vochure system like the Templars and Medicis offered. They, like all rich people, would find a way around this problem. Second, is the incentive/reward system is wrong. If the producers reach the point they are better off recieving, then the whole thing falls of it’s own weight. If the folks in Washington really want to use fairy tales for plans, they should research the ant and the grasshopper or the goose that laid the golden egg. I have enjoyed our conversation. We have bogarted Michael’s blog for our own satisfaction, and I apoligize for that. We are as far apart as our representative government in Washington. I guess that is why there is gridlock in DC. My world view has worked nicely for me and I assume your’s has done well for you. I see people walking around the neighborhood with nothing to do and I wonder why they don’t see the same opportunities I do. It’s the same neighborhood, banking system, incentive/reward system. Still, they don’t see it. I couldn’t get a job when I started this business, because I was too old and have heart problems. Yet I saw an amazing opportunity and went for it. To get back to Michael’s question, the best answer against hi speed rail is an express bus line. The infrastructure is there. If needs change, routes are easily dropped or new ones created, and compared to standing, like most light rail systems, a bus is more comfortable. It does not have the gee whiz of “Bullet Train”, but they are building one now in California. California has had a net population loss each year for the last decade. Who will ride it? Who will pay for it? blah blah blah! If it were express bus service it would already be running, and if all the jobs went to Nevada, Texas, Florida, or Tennessee; they could easily move the busses and start providing service in one of those states. In a nut shell, If high speed rail is that good a deal, why aren’t the railroads we already have putting it together? They have rights of way, experience, economy of scale. Why are they sticking to freight? PS. If we had the flat tax or fair tax the “special interest groups” would evaporate. Corps, SCorps, LLCs, proprietors, and individuals would all have the same deal. But if the lobbists went away, so would the money for campaign contributions and the unconstitutional powers that our representatives wield. The 3 groups hit the hardest by this sort of tax change are Lobbyists, Representatives, and CPA/Tax Attorneys. Therefore, we will never see any form of flat tax. The best we can hope for is close the loopholes and wait for the lobbyists to open them again, one at a time.